As we finish our second week of Jampar in Gyumri, I can’t help but reflect on the most amazing, life-changing journey I have ever experienced. My AYF Youth Corps adventure has been nothing short of exceptional. In the past four weeks I have spent in Armenia and Artsakh, I have formed unbreakable ties with amazing children, I have made several personal revelations and I have had the privilege of experiencing our beautiful land, culture, and people for the first time. As you could imagine, there have been many people that have contributed to my experiences throughout the past four weeks, and I would like to take the time to thank a mere few of them. Thank you to my 38 fellow 2015 youth corps participants and leaders, my second family. This trip would not have been the same without every single one of you, and I am beyond grateful to have been a part of such an incredible experience with such incredible people. Thank you to brothers Gor and Georgie from Camp Astkashen for courageously raising your hands on the first day of Jampar, asking to sing “Akhperus ou Yes” in front of our entire blue group. I will never forget the tears you brought to my eyes that morning when I first heard your passionate voices sing one of my favorite songs. This song will forever remind me of you two. Thank you to Unger Vahagk from Stepanakert, Artsakh, one of the most generous and inspiring individuals I was privileged to meet. From the second we arrived in Artsakh he made sure our time spent there was unforgettable, and because of him and the comfort I felt throughout my two week stay, I feel as though Artsakh is my second home. Thank you to Unger Zorig from Astkashen, Artsakh for opening your home to us and inviting us over one of the days after Jampar. While sitting around his table with my fellow ungers, I took a step back and cherished that moment, knowing I would remember it forever. Whether it was because of the songs we sang, the conversations we had, or the friendships we built, that day spent in Astkashen was one of the best days of my life. Thank you to Larissa, one of my campers from Camp Gyumri, who just so happens to be a four-year returning veteran to Jampar. I have never met a person filled with such energy and enthusiasm. Though I’ve only spent a couple of days with her thus far, I have become extremely attached to my new favorite nine year old. Earlier today while I was braiding her hair, Larissa turned to look at me and said the most special words I have ever heard: “Mernem gyankeed Ungerouhi Talar.” Thank you Larissa for allowing me the privilege to build an unbreakable bond with you that I will forever treasure. Thank you to my Youth Corps group, the 11 people that I have spent every day with for the past four weeks. Whether it was the many times we fought over who got to shower first or the thousands of times we argued over the rules of Steal the Bacon, this trip could not have been the same without you and I’m so thankful I was able to embark on this journey with you all. There is a special place in my heart for each and every one of you. Thank you to my motherland, the most beautiful land I have ever stepped foot on. This country and all that it has to offer has taught me to always appreciate all the small wonders around me waiting to be noticed. Having the privilege of walking down the streets of our country and speaking our beautiful language is unlike any other feeling in the world. There is truly no place like home, and I can’t wait to come home again. First day of Jampar in Gyumri was finally here and so was a camper named Ardo who had trouble written all over him. Within minutes it was obvious he was going to be the obnoxious troublemaker none of us had the patience to deal with. After just a few hours he had disrespected and bothered more than enough campers and counselors and was told to go home and not return for the rest of the week. Of course, he didn’t listen to that either and within a couple minutes of sending him home he magically appeared in the classroom again. He promised to behave and for some reason we believed him and let him stay. The next day before jampar even started he came up to me and said in Armenian, “Today I will behave, I have even learned all the songs you taught yesterday.” Very surprisingly he was the loudest one during song practice, he even threw his fist up with pride during the necessary times. It had become obvious that he learned respect and was ready to cooperate for the rest of the week. What wasn’t obvious was that he would end up being my favorite camper, the camper who would give me 40 kisses a day, and be the one to give me bracelets and presents every morning. Thursday morning was a little different than the other mornings – he handed me a best friend bracelet on which he had written, ‘I love you.’ He gave it to me so I would remember him forever and asked for something in return so he could remember me. Thursday night I went to the store looking for something small and appropriate. After a while I saw a dice keychain and knew that it was the perfect gift. A dice is the perfect way to describe everything that has happened to me on this trip so far. Ardo is one of seven children, his hygienic condition speaks for itself that his family isn’t the wealthiest, and I wouldn’t be surprised to hear that all seven children have one room to in which to sleep. This is where the dice comes in – Ardo and I both have 100% Armenian blood, but due to “paghd” (luck) he is living in such conditions, and I am living in the States, worried about which 2016 model car I want, when he will soon worry about how he will care for his family and himself financially. 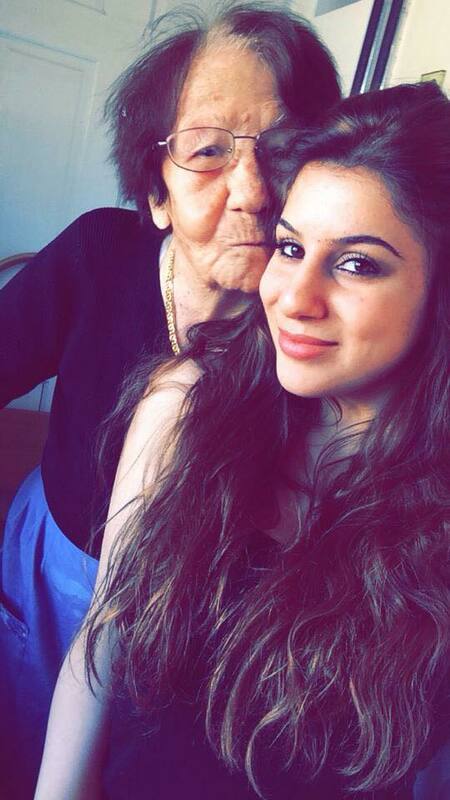 The destiny of two Armenians is as random as a roll of a dice; it all depends on luck, whether you end up with a one or a six. I do not deserve the lifestyle in America more than he does, in fact he is the one who allows me to have a homeland to visit, it is someone like me who falls victim to white genocide. This trip has made me realize that one of my dreams is only just a dream. A dream I would like to make a goal in the future would be to move to my homeland and raise a family. Unfortunately, during a discussion with my campers from Artsakh, I opened up under pressure and realized how different their lives are. These children who come in the morning with the biggest smiles, wettest kisses, and biggest hugs have brothers, fathers, and uncles who have died to keep our land, who are on the front lines to defend our land, and who soon will wholeheartedly join the army to keep our land. Standing in front of these teenage boys thinking I am doing a huge deed for my country while they are the soil and mountains keeping a country alive on a map made me realize the actual sacrifice I have to make. Hearing stories of how all three brothers and a father were killed leaving a mother alone made me ask myself a question – am I, or anyone back in the states willing to sacrifice all the male figures in their family just so we keep our land? I began to explain to Ardo why I got him a dice but tears didn’t allow me to finish. I watched the troublemaker of camp cry and it wasn’t because of a horrible “badeej”, it was because of an everlasting connection made between the diaspora and the homeland. Today, we went to visit the memorial of several fedayis that fought in the Artsakh war who were from Proshyan, the village where our first jampar is located. The unger who was explaining their stories to us used the word “sacrifice” multiple times, and I could not stop comparing the words to my friends who spoke to me before I embarked on my Youth Corps trip who said, ‘Props to you for sacrificing your whole summer.” At the time I agreed that I was also making a sacrifice; but standing in front of their memorials I began to doubt myself. What I was doing was not a sacrifice. This Youth Corps trip was something that I wanted to do, but now I have realized it’s something I needed to do. The constant pull between school, work, friends, and the Armenian Cause is something the average Armenian diasporan youth faces every day. There are tons of different external factors back in America that cause us to become distracted or lose focus when it comes to the Armenian Cause, but here in Armenia, I was finally given one that drew me in like a moth to a flame. In that moment, hearing the word “sacrifice” over and over again, I could see why I was here, clear as day — for the continued work of our ancestors through new means. We have the means of education, resources, and opportunity. We visited a second monument later that day — less of a monument, more of a square piece of granite cemented in the ground. This was the exact spot the former village mayor, Unger Hratch Mouradian, was assassinated. The reasons for his assassination did not interest me as much as the impact that this man had on every single member of that community. The genuine sorrow in the locals’ eyes as we all stared at this square of granite was proof that not only did this man make a difference in his community, but he had the potential to do so much more. My fellow participants and I had not even met this man and yet we began to cry as they told us his story, about his many sacrifices. There was an instance where the unger explaining said, “Unger Hratch knew that the new generation would thrive if given the right means.” For the past 12 years I have always thought of my friends and myself when I heard the words “nor seroont” or “new generation’. In that moment I heard shouting in the distance from our campers calling, “Unger Koko!” That’s when I realized that Unger Hratch was correct because that “nor seroont” was standing in front of his memorial learning about his good deeds while being called for by the “Nor nor seroont” to ask about a lesson we taught them at jampar that day. If there is one thing I know as fact, sacrifice is not a word that goes synonymously with the AYF Youth Corps program…but duty, might. It was finally Monday morning, the day I had been waiting for impatiently. It was the start of my group’s jampar (camp) in Artsakh. I woke up anxious and excited to meet the countless young children in our village. Sadly, that same morning I woke up to a message from my mother letting me know that my grandmother had passed away. That was the worst news I could have received on a day when I was ready to set out to meet and interact with our campers. I felt as though a part of me was gone—numb—unable to actually process the situation. 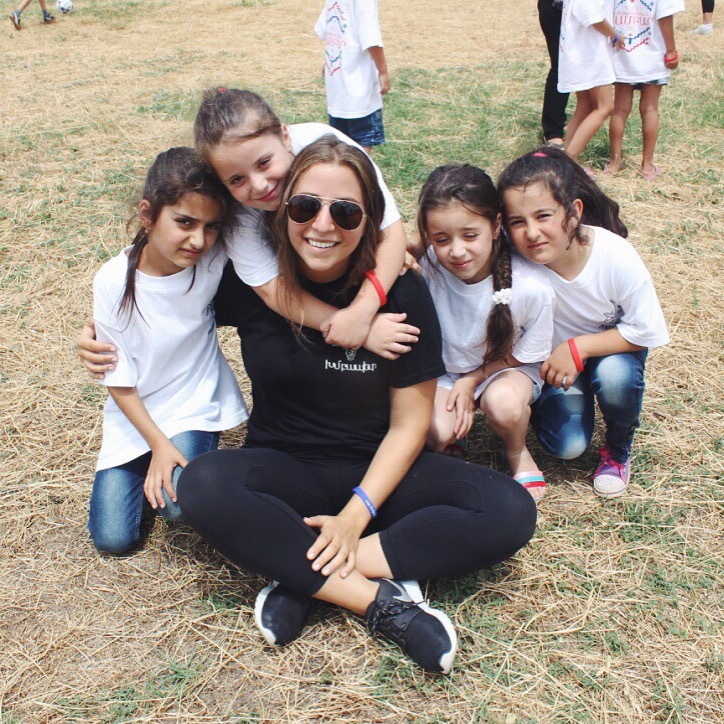 But for some reason, I wanted to participate in our first day of camp, I wanted to be there with everyone in Artsakh, in Gyumri, in Tavshud, with my fellow volunteers and with the hundreds of kids in our homeland. My grandmother would have been proud of the work that I was doing and would have supported anything that gave me happiness and satisfaction. 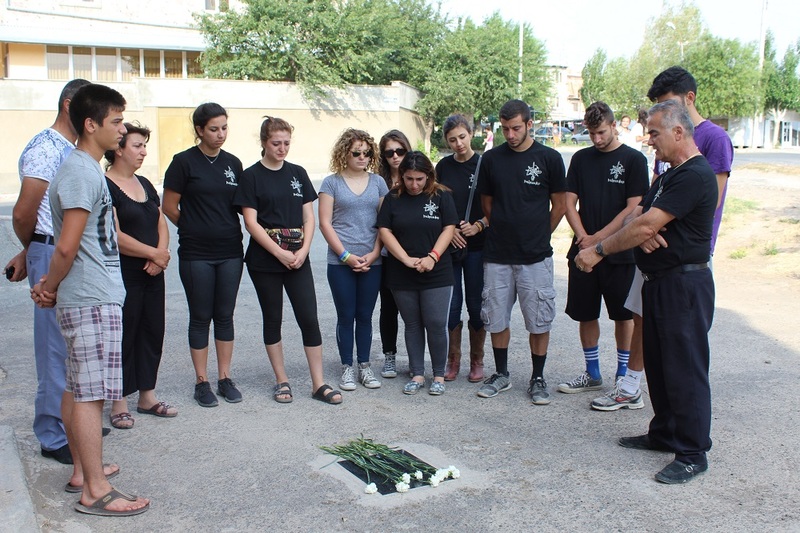 During this time, I couldn’t help remembering Sosé & Allen, who worked so many years to make the AYF Youth Corps program a reality, and who lived their dream by repatriating to Armenia. Their memory, along with the memory of my grandmother gave me the strength to stand up stronger than ever motivated to do good. 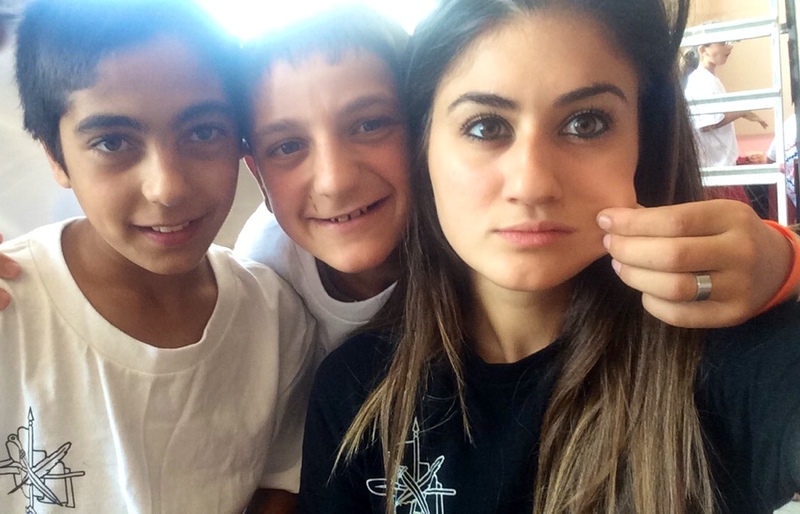 The jampar in Artsakh had begun, and the first week was definitely one of adjusting to the kids. We (the counselors) were essentially strangers in their minds (all 150 of them). Even with all the adjustments, I can say that it was an instantaneous and natural bond that was established with these children. By the second week I realized that our time was nearing its end (and we would be moving on to Gyumri). I did not want to think about it. In our short time, I had build friendships that I know will last a lifetime. but I didn’t want to say goodbye. One of memorable parts of jampar for me was prepping my group, which was the gabuyd (blue) team, for song competition; especially the young boy that I helped to do a solo for the song called “bidi bashdbanem” (“I will protect”). The dedication the group put into learning the songs was absolutely amazing. The little boys and girls singing that song made me feel especially proud and connected. Each and every morning the children would impatiently wait for us at the entrance of the school waiting for jampar to begin. 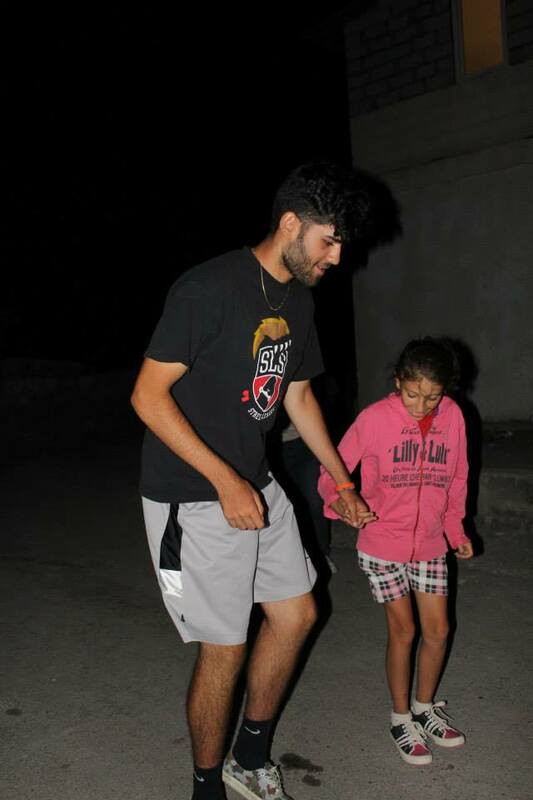 The last day of our camp in Artsakh was so touching, but I expected it. Saying goodbye is my weakness no matter what it comes down to. Signing these kids hands, shirts, and song books made them feel so special, and in a way made the counselors feel special because of what we meant to them – practically becoming their older sisters and brothers. Just like that, the two weeks in Artsakh had come to an end. But before I left, I made sure that I got the chance to light a candle at the beautiful Ghazanchetsots Cathedral in Shushi in memory of my grandmother, Sosé, and Allen. This was the perfect opportunity for me to pray and ask for their continual love and support. I had never felt better, and after many tears and many different emotions, I have been standing stronger than ever, ready for any type of challenge or situation that Youth Corps has to offer me. “Shad boyov eh, shad boyov eh”, was all the chatter I heard as I walked into the gym packed with eager little campers. It was registration day and I had the glorious position of occupying the campers’ time with games until camp officially began. I was frightened, since I have never worked with kids in my life. Yet I found myself excited to get camp underway in Proshyan. The transition from the practical European city of Yerevan to the village of Proshyan was remarkably easy. I fell in love with village life. The strong sense of community found in Proshyan was unlike anything I’ve experienced. The village has a strong ARF presence. Around Proshyan, the Tashnagtsoutyun is more than just a political party–it’s a lifestyle these villagers religiously follow. Words like “badanee,” “unger,” and “agoump” are held to an extreme I’m not used to experiencing. The strong traditional culture found here is what I want all us participants to extract back home to our own chapters. Wherever I go in Proshyan, I can feel the happiness our presence brings into the community. Children follow me through the streets wherever I go like I am of importance. Little do they know I’m usually just going up the street for some ice cream. On multiple occasions the villagers expressed their gratitude of how the Armenian diaspora has not forgotten about their homeland. They always leave me speechless and overcome with emotion. Nothing brings me more joy than knowing I’m instilling the best of both worlds onto our young generation. Knowing I’m shaping the future of Armenia is the most powerful feeling I have ever felt. From my explorations in Proshyan, it’s very obvious to me how far it has come as a village. It has such a bright future in these children and I personally want to remain a part of it. The hospitality, warmth and strength of the villagers have allowed me to find a home away from home. I love every minute of living here. My name is Harout Pomakian, I was born and raised in Los Angeles, but Proshyan adopted me. After an amazing first week at the Proshyan jampar, one of our weekend activities was hiking up Arakadz Ler. I’ve been to Arakadz Ler before, but I have never hiked up the mountain. On July 19th we went as a group with a few ARF members, and Badanees who attend jampar. As we were driving up the Badanees began singing revolutionary songs; songs we were not learning during camp. They were overjoyed to find that many of us knew the songs as well, and we began to sing together. Watching Rosa, Anahid, Marine’, and Aida sing, talk, and exchange riddles with us during our bumpy ride made me realize that our returning presence in Proshyan is truly making a difference in their lives. Seeing their excitement overwhelmed me with joy because I knew that I was experiencing something that not many people get to do. The villagers gave us advice on how best to climb the mountain – the girls assured us that they would be with us the whole time to offer their support. I continue to discover that they teach us as much as we are here to teach them. Being able to do this was something that was very exciting for all ten of us. 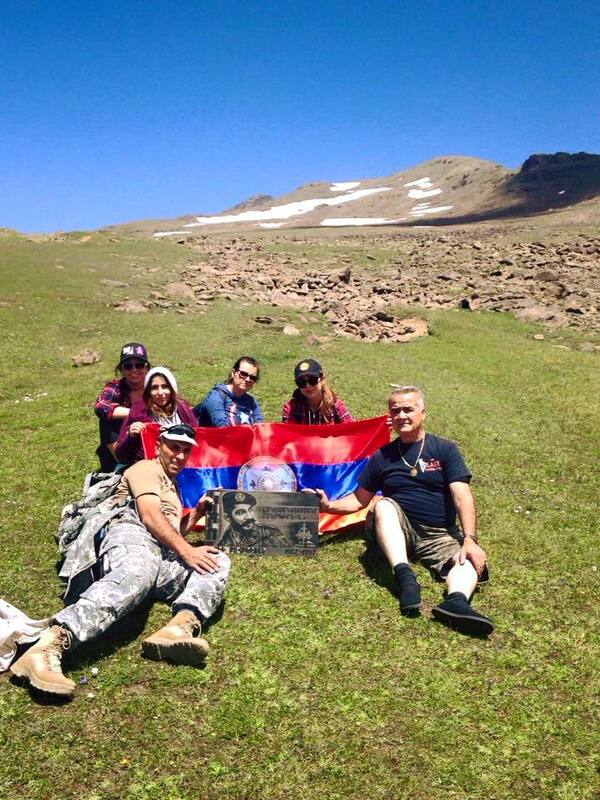 It is a tradition to carry an engraved stone up the mountain to honor someone who has dedicated their lives to the Armenian Cause. Last year they honored Unger Garod Mgrtchyan, to whom we dedicated our Proshyan jampar. This year the ARF members had brought an engraved stone that honored unger Garo Kahkedjian. The climb up the mountain was already tough – I couldn’t imagine how hard it was for Kile who volunteered to carry the 60-pound stone on his back! It proved to be a difficult climb indeed – with the cold, wind, and altitude. The weather was very cold, so cold we passed some large patches of snow at one point. Unfortunately I was unable to hike up to the top of the mountain – my ankle was still sprained from the previous week. So I sat in a patch of green grass with one of my group members and took it all in. I was three-quarters of the way up the highest peak in Armenia, gazing at a postcard-perfect view of Mt. Ararat just across the border. I sat in silence and listened to the wind; breathed in the fresh air of Hayasdan, felt the mountain beneath my feet…I was home.